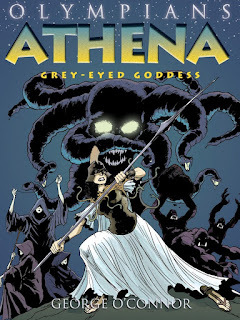 Athena: Grey-Eyed Goddess is the second book in George O'Connor's Olympians series being publishing by First Second. The previous book focused on Zeus as well as the ancient Greek creation myths. I've had a passing interest in ancient mythologies since I was a kid. The Greek and Roman stories were certainly the most widely available at the time, and Marvel's Thor comics had some basis in the Norse legends. But I also liked reading about the ancient Egyptians myths, various Native Americans legends and even a few African tales. (I don't recall having any Asian myths available to me back then.) I'm not entirely sure where the interest came from. I know I had copies of Why Mosquitoes Buzz in People's Ears and Arrow to the Sun as a young child, and I seem to vaguely recall reading/hearing other similar stories back then, so perhaps it was an interest cultivated by my parents. Or perhaps the obvious analogies to superheroes stuck out, and it was my interest there that later prompted me to check out Bulfinch's Mythology from the local library repeatedly. In any event, O'Connor's Olypians series certainly piqued my interest when I first heard about it, and I enjoyed Zeus enough to pick up Athena. Athena actually tells several distinct tales about the title character. It starts with her creation, which is followed by two different stories about how she came by the name Pallas. Next is the legend of Perseus and Medusa (known in contemporary culture primarily from the film Clash of the Titans) and the book ends with a short piece with Athena's encounter with Arachne. This is noticeably different than in Zeus which runs as a single, unbroken narrative. Interestingly, I find the storytelling works much in Athena precisely because of the distinction between stories. The challenge O'Connor had in telling Athena's legends is that her most significant stories are, compared to Zeus', short and disconnected from one another. In the end notes, O'Connor even points out that there were two different and almost contradictory stories in fact that tell how she adopted the name Pallas. So to string all these pieces together, O'Connor uses the three Fates telling the reader about Athena as a framing device. The book starts and ends with them. And why I think this is important is because readers were given an omniscient narrator in Zeus. So in Athena the reader is being directly addressed and more engaged in the story than in Zeus which feels more distant from the reader. I was actually struck in Athena by how it seemed to read much more like comic than a children's story. Zeus, to my recollection, was more a series of pictures with captions, only occasionally interspersed with some dialogue. But, as I went back to directly compare the two, I found that the amount of dialogue versus captioning was roughly equal. But since Zeus started and ended with narration, compared to Athena which started and ended with dialogue, it felt more like a children's book and less like a comic. The book, and indeed the whole series, is clearly designed with younger readers in mind. The "For Discussion" page at the back seems geared towards self-probing questions that most adults have probably asked themselves in some capacity, and the bibliography has a more extensive "For Younger Readers" section than "For Older Readers." Despite this, however, the main book itself never feels anything less than simply a good story about an ancient goddess. It's not "dumbed down" in any way that I can tell and, in fact, the "Author's Note" and annotations in the back seem more directed towards adults. I think O'Connor's storytelling abilities have improved from the first book to the second. Athena felt like a more comfortable read than Zeus and that does indeed bode well for the rest of the series. Zeus and Athena are in bookstores now; Hera and Hades are due out in the spring and fall respectively of next year.